St. Catherine of Siena clearly demonstrated the virtues of hope, magnanimity, and humility. This saint’s focus on the will of God often seemed crazy to others, but it teaches us that our lives should be oriented towards heaven. Sr. Maria Guadalupe is a perpetually professed member of the Dominican Sisters of Mary, Mother of the Eucharist, based in Ann Arbor, Michigan. 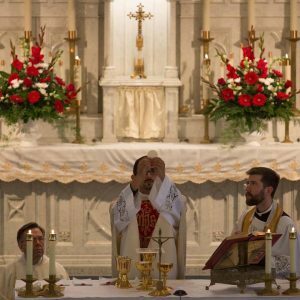 The Dominican Sisters of Mary are currently celebrating the 20th anniversary of their founding, and have grown from four Sisters to more than 125 during those 20 years. 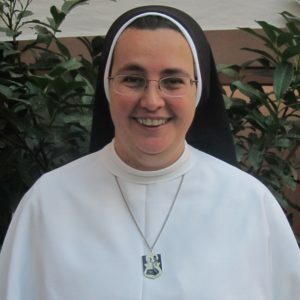 Sr. Maria Guadalupe holds a Bachelor’s Degree in English and French, post-baccalaureate certification as a secondary teacher, a Masters in Educational Administration, and last year studied in the Institute of Spirituality at the Angelicum, the Dominican Pontifical University here in Rome. Sister entered the community in 2001, and has been blessed to serve in many different capacities. Currently, she is a librarian for the Pontifical North American College here in Rome.